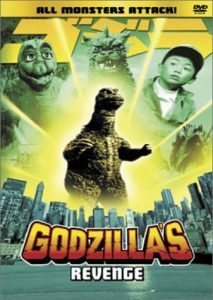 In All Monsters Attack (aka Godzillas Revenge), a young, bullied child whose parents are both working all the time dreams of visiting Monster Island, becoming friends with Minilla/Minya (Godzillas son), and learning life lessons to help him stand up against bullies and a pair of robbers. All Monsters Attack is a children’s movie, dealing with a young boy (Tomonori Yazaki) named Ichirô who is a latchkey kid, with very few friends. His father works long days for the railroad, his mother works long hours, and a neighbor in their apartment building (a toymaker played by Hideyo Amamoto) looks after him. Every day, he faces bullies at school, and in short, his life is unhappy. He finds refuge in fantasy, dreaming of visiting Monster Island where he becomes friends with Godzillas son Minila (or Minya, depending on the Japanese or American version). Minila is similarly younger picked on by a bully. Godzilla encourages his son to stand up to the bully, a lesson that the young boy realizes in his own life. The plot is further complicated by a pair of bank robbers who fear that the boy can identify them, and try to kidnap him. In short, All Monsters Attack / Godzillas Revenge is an enjoyable kids movie. If you have young children, they’ll enjoy it and you’ll enjoy watching it with them.